Habitat: Upland. This uncommon wildflower can be found growing on rocky outcrops and rocky slopes in desert grasslands near the Mexican border south to southwest of Tucson. Flowering Season: Summer, Fall. It mainly blooms in August and September after the summer monsoon rains. 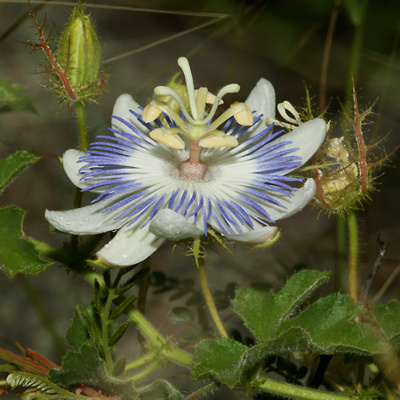 Description: The flowers are up to 2 inches (5 cm) across, surrounded by 3 green bracts that are tripinnately divided into numerous gland-tipped segments, and have 10 round-tipped, white tepals (5 petals and 5 petal-like sepals) and fleshy, lilac to lavender-blue filaments with white at their base. The flowers are followed by round to oval, 1 inch (2.5 cm) in diameter, yellow ripening to red fruit with soft, loose, juicy, whitish pulp surrounding black seeds. 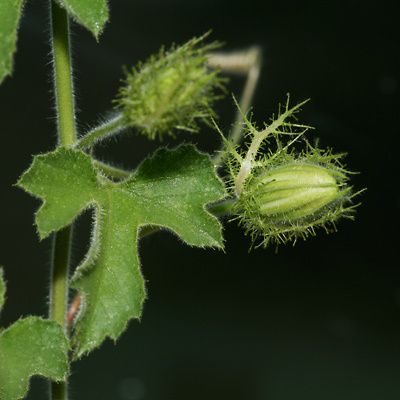 The leaves have irregularly saw-toothed margins, gland-tipped stipules, and are green, hairy, alternate, and deeply palmately lobed into 3 (rarely 5) lobes. The middle leaf lobe is the largest and is narrowed at the base, while the side lobes are themselves lobed. The stems have coiling tendrils and are green, slender, and densely hairy. This variety of Passiflora foetida can be identified by its irregularly saw-toothed, deeply lobed leaves with their narrow-based middle lobe and lobed side lobes. The net-like, gland-tipped floral bracts distinguish this species from the other Passiflora species found here in Arizona. 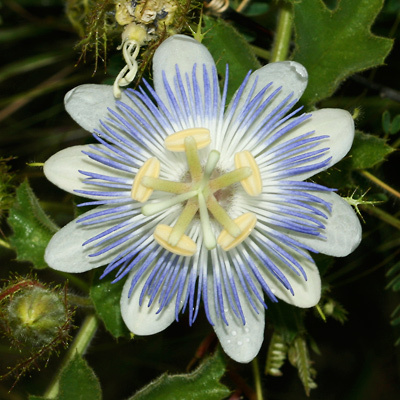 This unusual passionflower may be carnivorous, or at least protocarnivorous (on the evolutionary path to becoming carnivorous in the future). The bracts surrounding the flowers and fruit have glands that secrete both a sticky fluid to trap insects and digestive enzymes to digest them. This method for capturing insects is known as a flypaper trap, and it is also used by carnivorous plants like Sundews (Drosera species). Edible – The ripe fruit pulp is sweet and edible, but the fruits are small and contain little pulp. Foul-smelling – The foliage has a very unpleasant odor. Poisonous – The green parts of the plant are poisonous.